Corbets Tey caters for children from Reception to Year 11. We are continuing to develop our curriculum offer within school phases in line with the New National Curriculum. Teachers plan from the year expectations which are accessible and appropriate to the children within their classes. The curriculum is a vehicle of enrichment to teach hierarchical skills which become functional for life as children progress within developmental pathways through the school. We aim to ensure that our pupils are 100% engaged in their learning and this aspiration leads our curriculum development. We are continually learning what motivates and engages our pupils and this is illustrated through increased multi-sensory and active learning in lessons. We ensure pupils have regular opportunities for physical exercise in addition to timetabled PE and swimming. The curriculum is delivered in the above classes through a topic based approach following a two year cycle. Objectives are individual and specific to the communication and behavioural needs of pupils in this phase. There are six main topics interspersed with mini topics that last between one and two weeks. 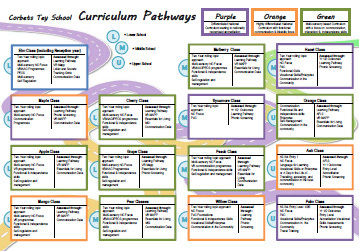 Click to the left to learn more about the curriculum in each phase group and about communication within the curriculum. In classes within Phase 1 access to topics will be determined by pupil need and ability to access concepts. When pupils reach Phase 4 they begin accredited courses with a focus on functional skills for life. In Phase 4 pupils are in parallel classes in which focus can be centred on priority of need. For some students the key focus will be on further developing functional communication and independence skills. For others the key focus will be on ensuring the highest academic qualifications as a passport to access to mainstream courses at a later stage in college. We are committed to considering the most appropriate pathways for each individual student and work in partnership with pupils, parents and carers to ensure common goals and aspiration. We believe it is essential to ensure that every child is helped to become the most effective communicator they can be. This may be through verbal language, sign language or a visual method of communication which may be through photograph’s, symbols, iPad communication or a specialist augmentative communication devices. For our most verbal children we develop thinking, reasoning and expressive skills through Philosophy for Children opportunities. Our newly formed ‘Orchard’ allows children of all ages to benefit from small language and communication based classes where skills are intensively taught and tracked within a sensory based curriculum. We are happy to train parents in the programmes their children are following to promote seamless transition from school to home. We also have a parent resource library to provide stimulating and appropriate games and activities to consolidate learning at home. The reading scheme that is used within the school and additional resources for reading can be accessed through the online resources at Oxford Owl. We are using the latest versions from the Oxford Reading Scheme including Project X and Oxford Reading Scheme Books and these now include resources for all ages and reading levels which focus on the skill development level and age appropriate resources. All families can follow these instructions of how to log in to the website so you can access the available resources and online books. The main phonics scheme used throughout the school is Letters and Sounds providing a 6-phase teaching programme to teach children how the alphabet works for reading and spelling. This is complemented with other schemes where necessary. At Phase 5 students progress through OCR Life and Living Skills entry level accredited courses with a strong focus on functional skills for life. For some students the key focus is on further developing functional communication and independence skills. For others the key focus is on ensuring the highest academic qualifications as a passport to access to mainstream courses at a later stage in college. All personal learning pathways are planned around a young person’s interests and abilities and we work on the next steps to facilitate achievement of long term outcomes detailed in Education Health Care Plans. This could be a move to supported living placement, work placement/work experience opportunities or further study on vocational college courses. Copyright 2015 Flat Pack was created in WordPress by Obox Themes.